Night falls over the watery canals of Venice, and the reflections become luminous lines and wriggles. Street lights throw luminous pools across pavements and water, and upwards onto ancient brickwork and windows. A classic wooden speed boat lies gleaming in its stalls, waiting for the call to transport us over the winding waterways. 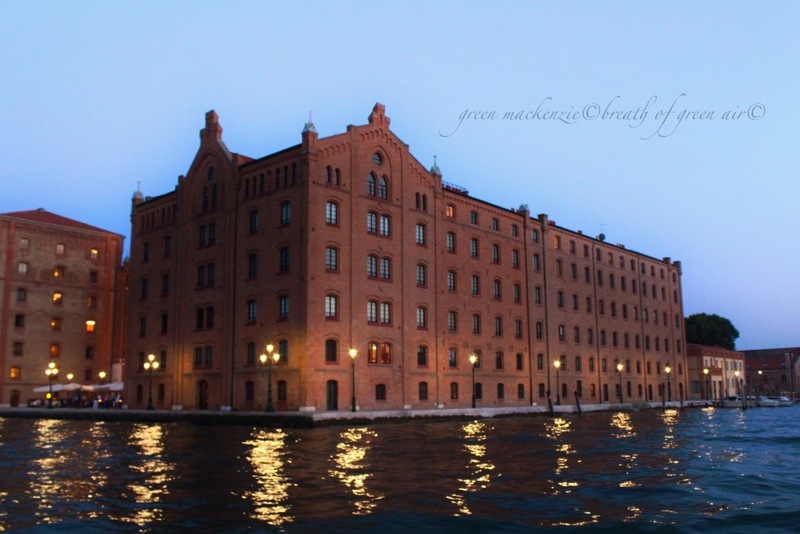 On the Grand Canal, light spills carelessly between buildings and boats. The green hue of the water catches unearthly light, and throws it back skywards. The water licks lazily at the pontoons and the stone walkways, and the street lights blaze as they have done for centuries. 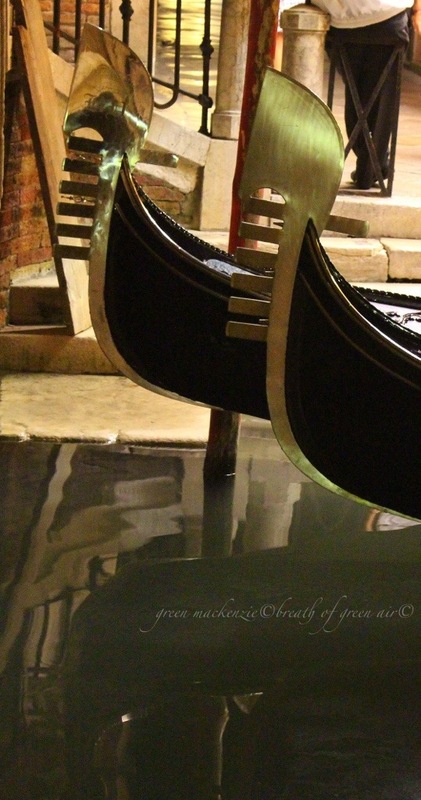 Gondolas nod dreamily under bridges, and the water stills to smooth silk, as the traffic heads home for the day. Corners of light come alive, showing us worn steps leading down to the water and the side of passing boats dipping into the shadows of bridges. From the sleepy dim backwaters we spill out under the arch of a bridge, back onto the main waterway. People throng towards St Marks Square, and the ancient wrought iron lights show the way over the old stones of the street. 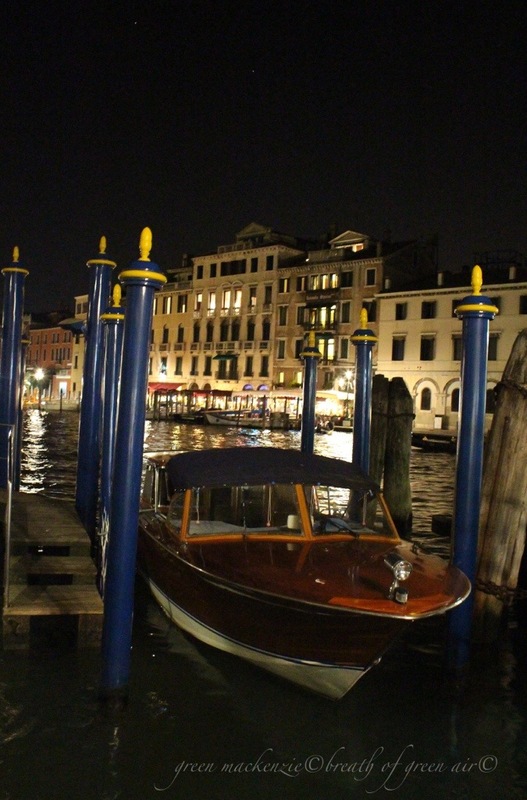 This entry was posted in history, mindfulness, photos, relaxation, travel, weekly photo challenge and tagged city, Europe, mindfulness, night, photography, postaday, Reflections, relaxation, travel, Venice. Bookmark the permalink. How beautiful. The photos and the dreamy flow of your words make me wish I too could visit Venice one day. I’d like to be among the throngs of people headed towards St. Marks Square. I’ve always wanted to go to Venice. It was as good and better than I had hoped and expected! Lovely. 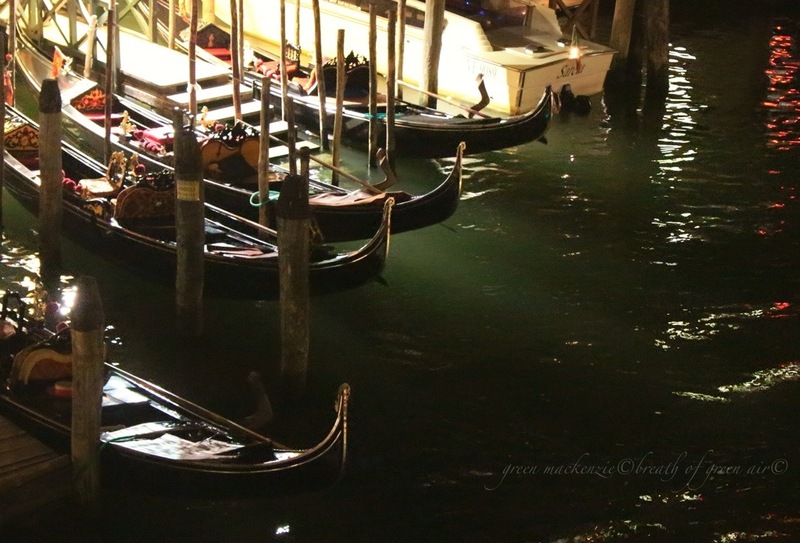 The gondolas are so beautiful and all the lights…Truly magical! They are very elegant boats to watch as they move seemingly effortlessly through the canals. So romantic and timeless in their appeal….magical indeed! I like the bronze in the 4th photo as well, they look like something from ancient Egypt! 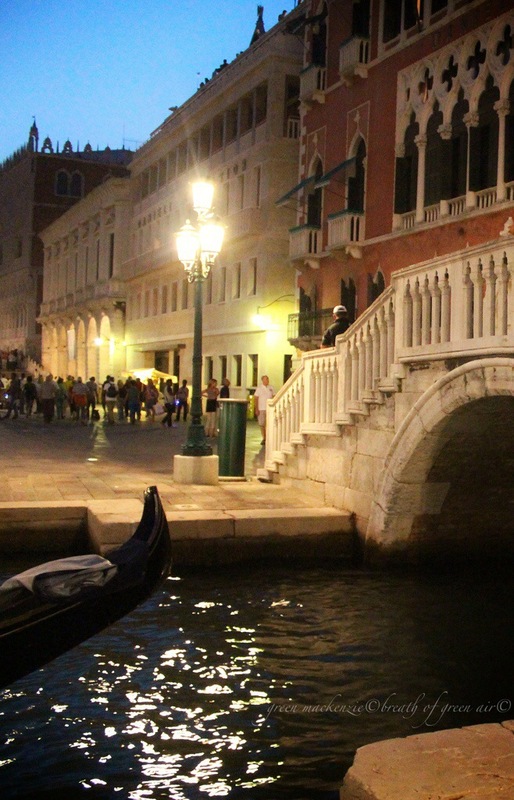 Such magical shots, your night time, Venice, Seonaid! I especially like the blue posts and the prow of that gondola. You’ve been very disciplined in waiting for the moment to post these. I always want to launch mine straight out there, but it really isn’t possible is it, especially when you work. Do you do much photo processing? They really are superb and capture the atmosphere as well as your words. I use an app called Snapseed on my iPad for most of my processing. Hope you enjoyed your Edinburgh trip…it’s pretty mild up here at the moment for December! What a great spot for a light challenge. My favorite is the gondola close-up but they are all lovely. Nicely done Seonaid! This post brought back such great memories, Seonaid. 🙂 Venice is such a magical city, especially at night. I can only agree, night time was special 🙂 it’s one of those places I would go back to in a flash! I was in Venice when I was a child/young girl and all I can remember is these canals, the gondolas and a glassblowing factory that introduced me to the wonders of beautiful glass. What is Venice like these days? I heard there is a lot of pollution and way too many tourists during the summer. But still, it must have kept its beauty…. It all looks very romantic. Beautiful! We visited Venice a few years ago but during the day. I can only imagine through your photos how beautiful it must be. Awesome pics … Nicely put together ..